London and Afternoon Tea go hand in hand. Of course there is the quintessentially British afternoon tea but if you fancy something a little different from your usual, then try one of these exciting and fun themed afternoon teas. The Sanderson Hotel Mad Hatter’s Afternoon Tea has got to be one of my favourite afternoon teas in London. It’s definitely the perfect place to celebrate a birthday or just to enjoy a relaxing afternoon filled with cake of which there is plenty. The Mad Hatter’s tea is all about jumping down the rabbit hole and experiencing an Alice in Wonderland inspired afternoon tea. Discover menus hidden inside vintage books, king and queen designed teapots and sandwich plates decorated with bird cages, carousels and ticking clocks. The food is plentiful, with savoury sandwiches, warm scones and numerous sweet treats that never seem to end. Don’t forget to have some jelly from the trolley afterwards. 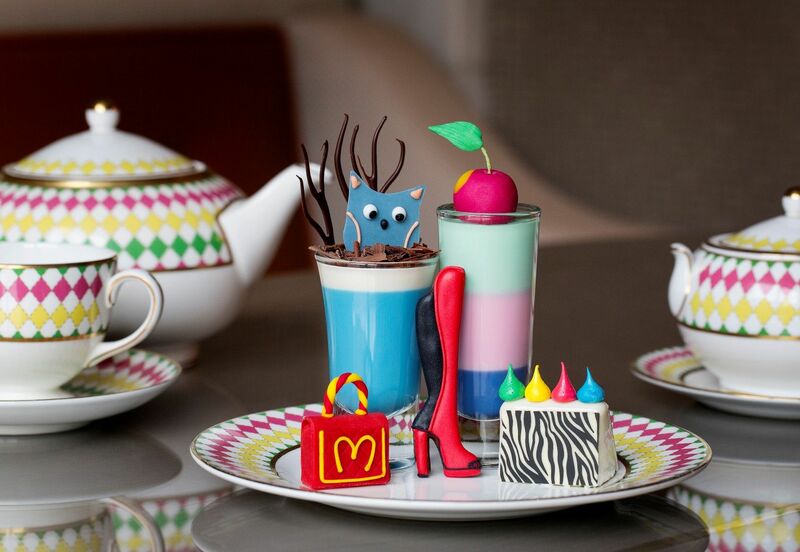 Sanderson Mad Hatters Afternoon Tea is priced from £48 per person. Click here to book. 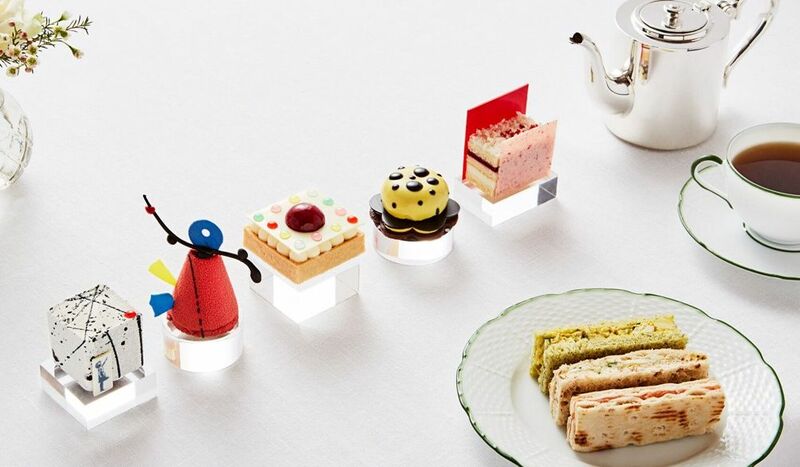 Rosewood London’s Art Afternoon Tea is served in the Rosewood’s beautiful Mirror Room and the tea itself has a fun art theme inspired by modern artists that include Yayoi Kusama, Damien Hirst, Alexander Calder, Banksy and Mark Rothko. The Banksy creation is a chocolate cube filled with vanilla cream choux, salted caramel, chocolate cremeux and the Damian Hirst inspired treat is a cassis jelly, yuzu curd, white chocolate tart finished with Hirst dot decoration. Sandwiches include smoked salmon and cream cheese as well as coronation chicken, curry and sultanas. Art Tea at The Rosewood London is priced from £50 per person. More details www.rosewoodhotels.com. 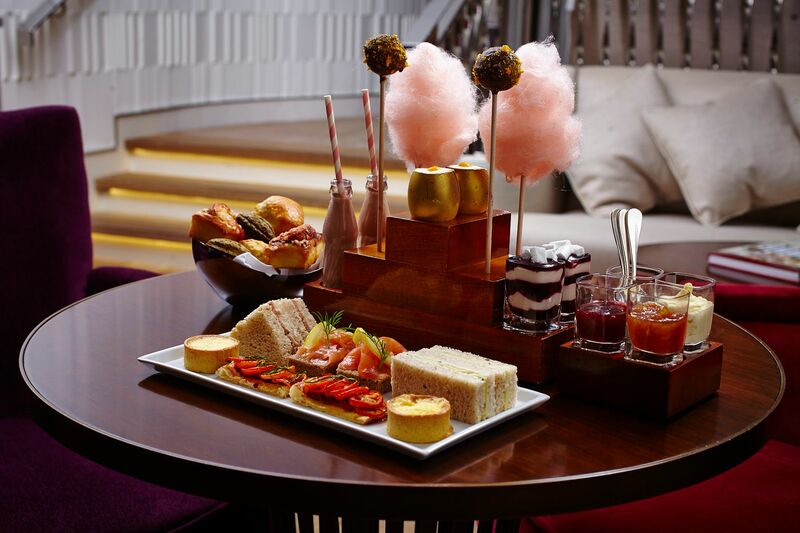 At One Aldwych the afternoon tea is inspired by Charlie & The Chocolate Factory, which funnily enough ran until recently at the Theatre Royal round the corner from the beautiful hotel. Afternoon Tea is a mix of sweet and savoury; expect delicious sweet items such as the golden egg with vanilla cheesecake and mango puree, rhubarb and vanilla doughnut and chocolate caramel milk. There is also a selection of scones and savoury items such as roast beef and mustard mayo and smoked salmon sandwiches. One Aldwych have also created a special cocktail to match entitled Cocktail Charlie. Presented in a spectacular smoking teapot along with three home-made chocolate truffles. One Aldwych Charlie & The Chocolate Factory Afternoon Tea starts from £39 per person, more details visit www.onealdwych.com. St James’s Hotel have partnered up with one of London’s top toy stores Hamleys, to create an exciting board game afternoon tea concept. The theme of the afternoon tea is based around traditional family favourite board games, think Monopoly, Snakes & Ladders, Backgammon and Ludo. 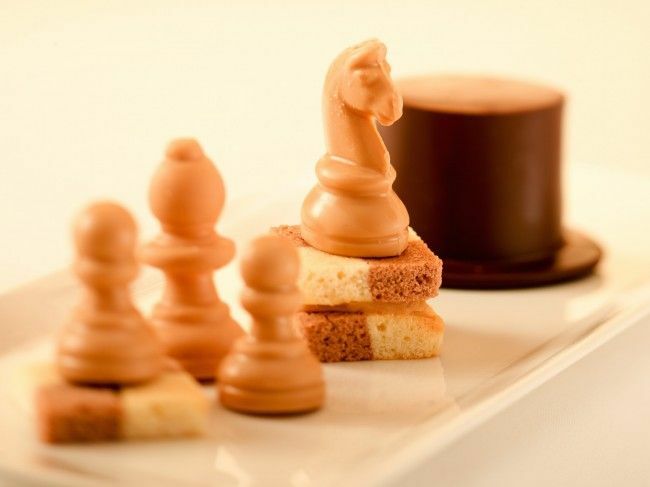 Each game sets the scene for a delicious cake; Monopoly is a dark chocolate top hat filled with a blood orange mousse and finished with a dark chocolate and silver glaze, where as Scrabble is a bramley apple mousse set on a genoise sponge finished with white and dark chocolate scrabble pieces. ‘It’s All In The Game’ Afternoon Tea at St James Hotel & Club is priced from £40pp and children under 12 can eat with 50% off. More information and to book visit www.stjameshotelandclub.com. If you are a fashion lover or know someone who is then Prêt A Portea at The Berkeley will be an absolute treat. The afternoon tea has a mixture of savoury items, that include a range of sandwiches and more interesting choices like the swordfish served on a mini spoon and a chicken pate and chestnut cone. Scones are served warm but it is the cakes that are the main star of this tea. Each cake has been carefully handpicked and designed to match a top designer’s latest trend. Expect a Burberry trench coat biscuit, a Jimmy Choo pointed toe shoe of velvet praline cake and Moschino’s blood orange sponge ‘yellow M’ handbag. Don’t be afraid to ask for more cakes and sandwiches as they are more than happy to oblige. Pret A Portea at The Berkley starts from £52 per person. More details at www.the-berkeley.co.uk. 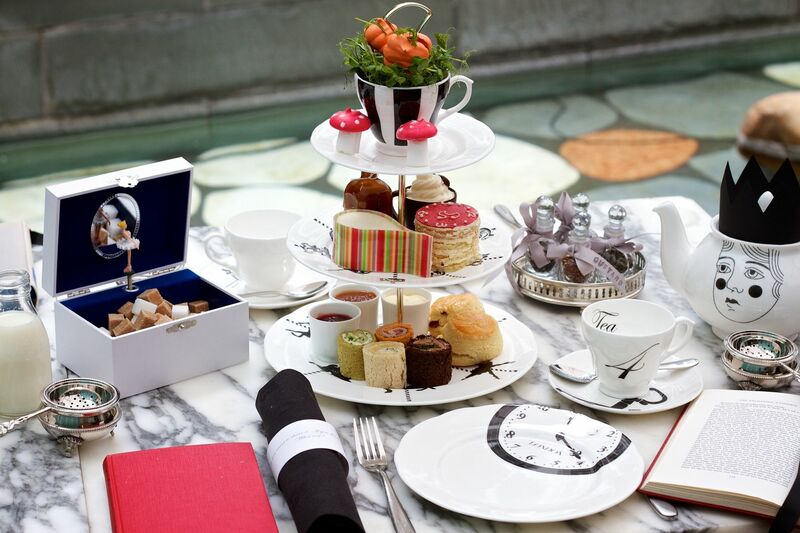 For more afternoon tea in London recommendations check out our post on the best London afternoon tea. I want to got all of these tea parties! I love the artistry the bakers put into all those little tea pastries and sandwiches- so great!